Don’t be alarmed if you hear the lions roar when you check in at The Cruickshank Residence! 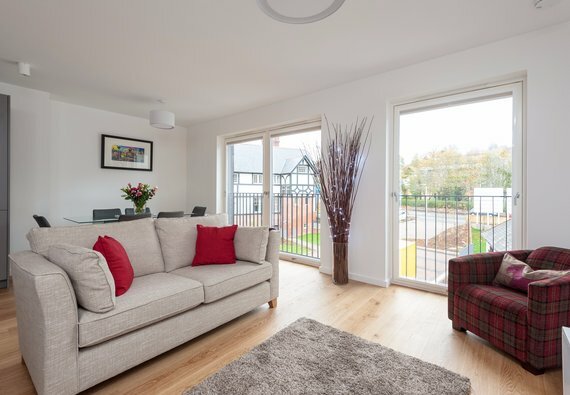 Edinburgh Zoo, one of Auld Reekie’s most popular attractions, is just across the road but fear not, they have very sturdy enclosures… Sleeping up to five guests in style, this modern apartment with designated parking is perfect for your next city break. Prepare to be wowed as you step in to the spacious, open plan living and dining area with sleek, contemporary design. All of your entertainment needs are met, from the 50-inch Freeview TV with Blu-ray DVD player, to the board games and a large selection of DVDs. There’s also super-fast WiFi, complimentary to all of our guests. Over in the immaculate kitchen you’re met with everything you need to rustle up your own home cooked treats. There’s an oven and microwave, a large fridge and ample freezer space. Fancy letting someone else do the dirty work? No problem, the local area boasts of plenty of coffee shops and eateries so be sure to ask your property manager for some personal recommendations. The bedrooms are spacious with plenty of wardrobe space and feature one king-size master bedroom with en suite shower room, one double bedroom, and one single bedroom. Guests are treated to a little slice of luxury, as the en suite and family bathroom (with shower over bath) both benefit from heated floors and towel rails. There’s plenty of storage throughout, including ottoman style beds to store your luggage, and a large utility cupboard with a washer/dryer, an iron and ironing board and a hairdryer. The final perk of this fantastic property, is a designated parking space and a secure lock up if you decide to bring or hire bikes for your visit. In terms of location, you are in the wonderful, leafy and historic area of Corstorphine. There’s plenty of information on Edinburgh and the local area in the apartment, including suggestions for walking tours taking in the 17th Century Forresters Dowers House and the Dovecot. A little more effort you can reach Clermiston Tower, a monument for Sir Walter Scott in the Corstorphine Hill Nature Reserve and from the walks and pathways you will have spectacular views of Edinburgh, the Firth of Forth and on a clear day see Glasgow at the end of the central belt. If you can peel yourself away from the local attractions, you’ll find yourself amidst Edinburgh’s famous medieval Old Town in no time. The bus stops practically at your door, and there are 3 main services that will drop you on Princes Street, George Street or take you over the North Bridges into the student quarter. That’s at least 6 services in one hour by the 26, the 31 and the 12. The buses to and from Edinburgh Airport, Waverley and Haymarket train stations, Glasgow and Stirling all stop outside the Zoo and there are numerous taxis on this main route. A short walk will take you to the tram stop at Balgreen and combined with your road routes to the motorways and ring road you can easily explore further afield. Sleeping arrangements One kingsize bedroom with en suite, One double bedroom and One single bedroom. Accessibility statement This property is located on the second floor, with lift access. Interior layout A central hallway leads to an open plan living/dining/kitchen area, three bedrooms (one with en suite), and a family bathroom. The host is very very friendly, the apartment is in a perfect condition. Reserve Apartments was very responsive to all of my questions. I would recommend their service for anyone looking for an apartment to rent in Edinburgh. My family of four loved this apartment. It was exactly as advertised and the apartment is the perfect size for families. The owners and property manager were very responsive to our questions and requests. We didn't use public transportation so it was an added bonus to have a reserved parking spot. We will definitely be returning to The Cruickshank Residence for our next trip to Edinburgh. A very new, clean, tidy apartment with a modern hi-tech and well-appointed kitchen, very comfortable beds and the perfect location for the Zoo as well as hopping on any passing bus for the short ride into town. Communication beforehand was quick and easy, all arrangements went perfectly.